Forest Cannon, postdoc at CW3E, along with CW3E director Marty Ralph, fellow postdoc Anna Wilson, and UCLA professor Dennis Lettenmaier, recently published a paper in the Journal of Geophysical Research – Atmospheres, titled: GPM Satellite Radar Measurements of Precipitation and Freezing Level in Atmospheric Rivers: Comparison with Ground-Based Radars and Reanalyses. In their study, satellite radar reflectivity profiles from the Global Precipitation Measurement Dual-Frequency Precipitation Radar (GPM) were used to evaluate precipitation and temperature characteristics of Atmospheric Rivers (AR) over the western coast of North America and eastern North Pacific Ocean. 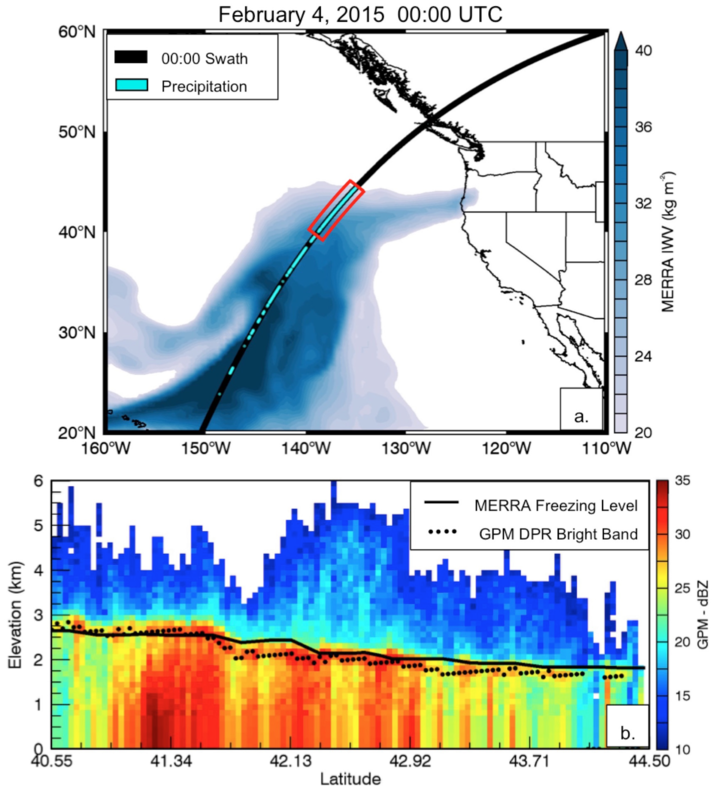 Notably, their comparison of GPM bright band height with a network of ground-based vertically profiling radars along the West Coast demonstrated exceptional agreement, as did comparison with freezing level height from reanalyses over the eastern North Pacific Ocean (Figure 1; Figure 5 from the paper). These results indicate that GPM can be used to independently validate freezing level in models. Figure Caption: (a) A GPM-DPR swath through AR conditions on February 4, 2015 at 0:00 UTC, and (b) the vertical profile of reflectivity from the Ka-band along the center of the GPM DPR swath subset within the red box in the top panel. Additionally, the study identified significant differences in the frequency and intensity of precipitation between GPM and reanalyses over the eastern Pacific Ocean, indicating biases in both satellite-observed and modeled AR precipitation. Importantly, low-intensity precipitation rates accounted for a 20% increase in total precipitation in reanalyses compared to GPM-DPR, and AR conditions, specifically, contributed nearly 10% more to total GPM precipitation than reanalyses. These results demonstrate that the advanced GPM satellite radar yields tremendous benefit for reducing the data gap over the global oceans and for supplementing the current understanding of precipitation processes in ARs.